Theta burst stimulation, a patterned form of TMS administered as pulse triplets typically at a frequency of 50 Hz (50 pulses per second), has consistently produced longer lasting results than conventional TMS with fewer side effects. 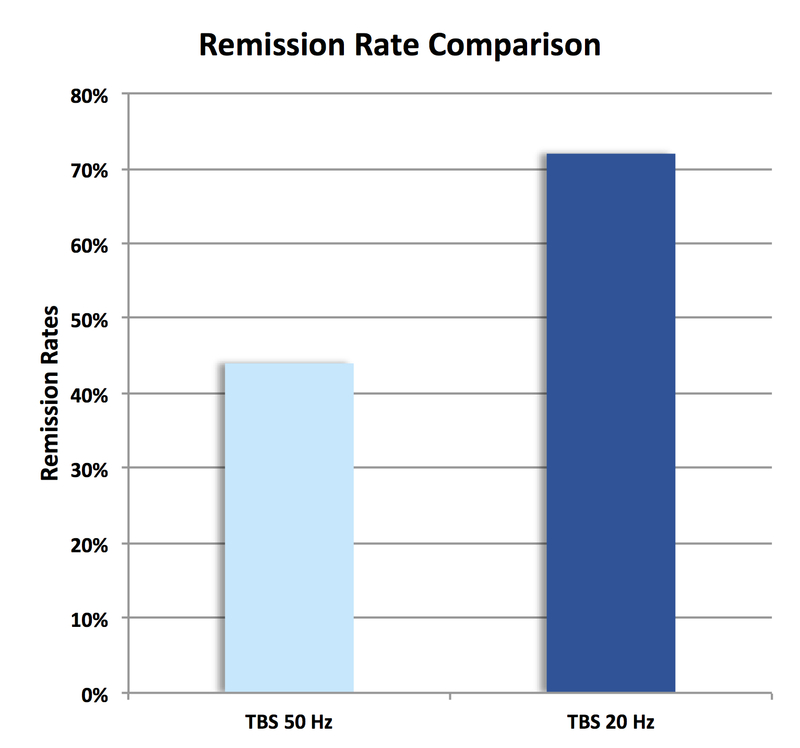 Dr. Stubbeman has further enhanced this robust form of TMS by applying a novel Theta Burst 20 Hz (20 pulses per second) protocol to improve clinical effectiveness, as visualized in the two graphs at right. On average, only one out of three of patients will completely recover from their depression after treatment with conventional or deep TMS, whereas more than two out of three patients completely recover after treatment with Theta Burst 20 Hz TMS. The efficacy and proven superior safety of Theta Burst 20 Hz TMS treatment make it the optimal treatment choice for patients who cannot take medication or who have failed other types of treatments for depression. For more on Theta Burst TMS, please read our paper published in Brain Stimulation Journal, and Dr. Stubbeman’s interview in Magventure News. Daly EJ, Singh JB, Fedgchin M, Cooper K, Lim P, Shelton RC, et al. Efficacy and Safety of Intranasal Esketamine Adjunctive to Oral Antidepressant Therapy in Treatment-Resistant Depression. JAMA Psychiatry 2018;75:139. doi:10.1001/jamapsychiatry.2017.3739. Dunner DL, Aaronson ST, Sackeim HA, Janicak PG, Carpenter LL, Boyadjis T, et al. 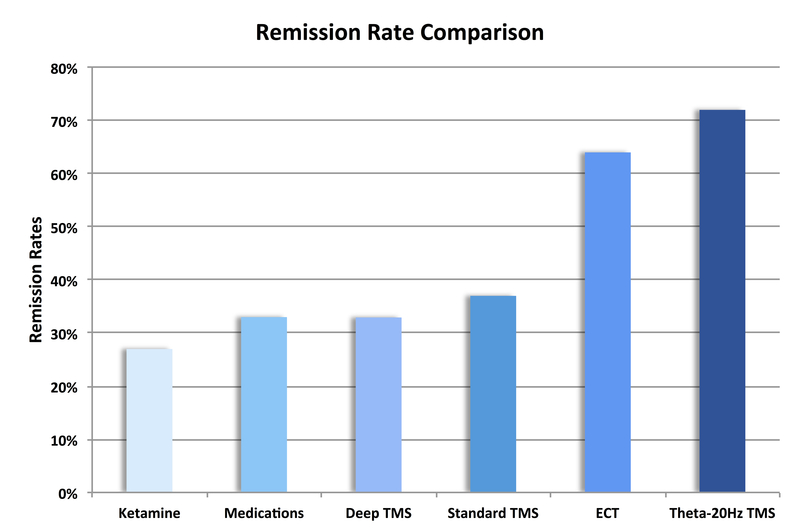 A Multisite, Naturalistic, Observational Study of Transcranial Magnetic Stimulation for Patients With Pharmacoresistant Major Depressive Disorder. The Journal of Clinical Psychiatry 2014:1394–401. doi:10.4088/jcp.13m08977. Kellner CH, Knapp R, Husain MM, Rasmussen K, Sampson S, Cullum M, et al. Bifrontal, bitemporal and right unilateral electrode placement in ECT: randomised trial. British Journal of Psychiatry 2010;196:226–34. doi:10.1192/bjp.bp.109.066183. Olgiati P, Serretti A, Souery D, Dold M, Kasper S, Montgomery S, et al. Early improvement and response to antidepressant medications in adults with major depressive disorder. Meta-analysis and study of a sample with treatment-resistant depression. Journal of Affective Disorders 2018;227:777–86. doi:10.1016/j.jad.2017.11.004. Plewnia C, Große S, Zwissler B, Fallgatter A. Treatment of major depression with bilateral theta burst stimulation: A randomized controlled pilot trial. Clinical Neurophysiology 2013;124. doi:10.1016/j.clinph.2013.04.190. Rapinesi C, Kotzalidis GD, Ferracuti S, Girardi N, Zangen A, Sani G, et al. Add-on high frequency deep transcranial magnetic stimulation (dTMS) to bilateral prefrontal cortex in depressive episodes of patients with major depressive disorder, bipolar disorder I, and major depressive with alcohol use disorders. Neuroscience Letters 2018;671:128–32. doi:10.1016/j.neulet.2018.02.029. Stubbeman W, Ragland V, Khairkhah R, Vanderlaan K. Efficacy of novel twenty hz theta burst pulse parameter in the TMS treatment of refractory depression. Brain Stimulation 2015;8:397–8. doi:10.1016/j.brs.2015.01.269. Stubbeman WF, Zarrabi B, Bastea S, Ragland V, Khairkhah R. Bilateral neuronavigated 20Hz theta burst TMS for treatment refractory depression: An open label study. Brain Stimulation 2018;11:953–5. doi:10.1016/j.brs.2018.04.012. 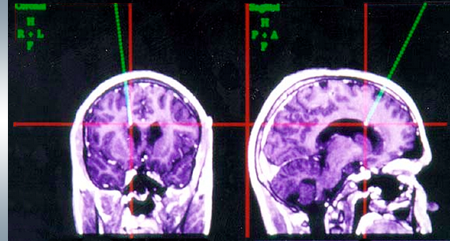 Dr. Stubbeman utilizes neuronavigated TMS, a precision targeting system which results in the most effective form of TMS treatment (Langguth et al., 2010). A patient’s digital MRI scan is used to create a 3D image of the brain. Next, the patient’s head is spatially correlated with the newly created 3D brain image using a series of reference points. An infrared camera then tracks these positions in order to represent the patient’s head relative to the TMS treatment coil, allowing the clinician to visualize in real-time where on the brain the electromagnetic pulses are delivered. A study done on the standard method (targeting without neuronavigation) showed that the distance between the actual target and the target determined by the standard procedure was greater than 20mm for 54% of subjects, while only one out of eleven subjects was correctly targeted (Nauczyciel et al., 2011). The uncertainty from this method stems from structural variability between individuals’ brain and inconsistent positioning of the treatment cap. Neuronavigation methods correct for the former through the real-time visibility of each patient’s MRI, and correct for the latter by remarking reference points every treatment session. Langguth, B., et al. RTMS for the Treatment of Tinnitus: The Role of Neuronavigation for Coil Positioning. Neurophysiologie Clinique/Clinical Neurophysiology, vol. 40, no. 1, 2010, pp. 45–58., doi:10.1016/j.neucli.2009.03.001. Nauczyciel, Cecilia, et al. Assessment of Standard Coil Positioning in Transcranial Magnetic Stimulation in Depression. Psychiatry Research, vol. 186, no. 2-3, 2011, pp. 232–238., doi:10.1016/j.psychres.2010.06.012. Dr. Stubbeman administers quantitative electroencephalography (QEEG), which is used to measure electrical patterns on the scalp that reflect brain activity. Not only are the brain waves recorded, but their sources are also overlaid onto the patient’s MRI using a method called swLORETA. 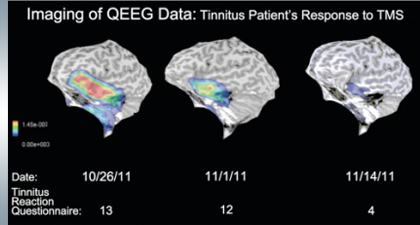 This essentially quantifies the intensity of a patient’s tinnitus (Ashton et al., 2007).